After the chaos of meeting up with everyone and getting all of our kit onto the boat, we find ourselves sitting on the deck and sipping a drink as the boat chugged out towards the blue hills on the other side of the lake. Kariba is a huge man made dam, over 200km long with a large proportion of its shores on National Parks Wildlife areas. Fully staffed with a captain, cook and deck hand, our cruise would ensure, even enforce 5 days of total relaxation. Our days are spent fishing, eating, sipping drinks and playing board games while watching the elephants and other game go about their business. The nighttime is punctuated by the sounds of the many hippos snorting and bellowing. Once a day when the boat is far from shore it stops and we all take turns jumping from the upper deck into the water. 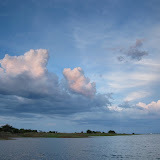 One of my favourite things about Kariba is watching the clouds building up into massive, looming, towers of white, which in the late afternoon and evening start flashing with lightning. This spectacular display can be seen seemingly every day, but on the first day it was particularly epic. The clouds built and build, but this time they were lit by the most amazing pink and orange light as the sun went down down in a blaze of orange on the opposite horizon. As if this was not enough, it gave way to a huge show of lightning that lasted well into the night. It was accompanied by an amazingly strong, unrelenting wind that was blowing over the heavy chairs and threatened to take the whole carpet off the deck. All in all a wonderful trip and a good chance to catch up with friends and family. After shopping for a few curios in Kariba town we heading back to Harare, well fed and well rested, ready for even more feeding and resting over the Christmas period. Adventures of Dean and Sophie is powered by	WordPress 2.8.5 and delivered to you in 1.272 seconds using 33 queries.